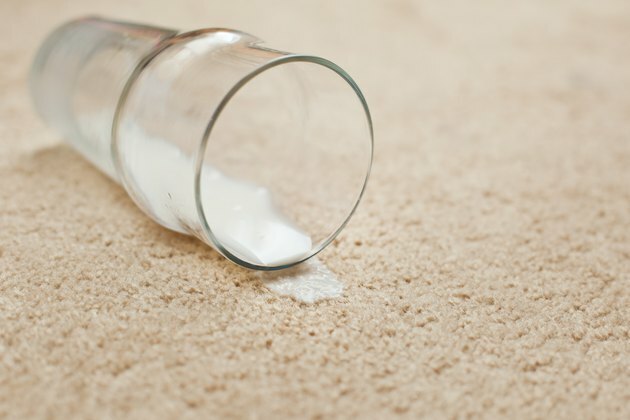 Spilled milk isn't that difficult to remove from your living room or automobile carpeting when it's fresh, but if you don't get all of it, or you don't clean it in time, it can spoil and create an overwhelming odor. Milk becomes most problematic when it soaks deeply into the pile and dries. When this happens, you may have to resort to a combination of treatments to get the stain out and deodorize. If you can deal with a spill as soon as it happens, the chances of permanent damage are slight. Start by blotting up as much of the spill as you can, using paper towels; then mist the residue with water to prevent it from drying out. Make a paste using powdered laundry detergent and water and work it into the stain with your fingers or a toothbrush, and rinse the area with plenty of cold water. Sprinkle cornstarch on the stain and let it dry; vacuum the cornstarch away. If the stain is fresh, this is probably all you need to do. You often don't have the luxury of getting to the stain while it's fresh, which means that you're dealing with dried milk and, if the spill has been there long enough, an odor. The first order of business is to remove as much of the dried milk as possible. Scrape it with a dull knife to remove any milk that flakes off; then wet the remainder with water and scrub it with laundry soap paste and a toothbrush and rinse. Be sure to use cold water; warm water will set the stain and increase the odor. You can also blot the stain away, using paper towels and isopropyl alcohol. A number of commercial carpet cleaning and deodorizing products can handle spoiled milk odors, particularly those designed for pet odors. If you don't have any of these around the house, hydrogen peroxide from your medicine cabinet will work. Spray it on the spot; leave it until it stops foaming and blot it up. 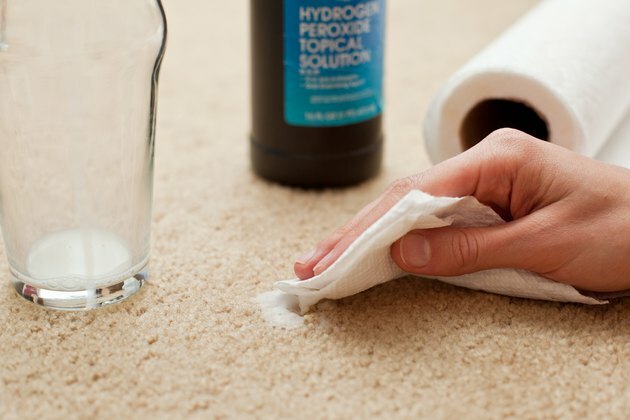 Use only regular 3 percent peroxide; anything stronger may damage the carpet. You can also treat the spot by making a paste with borax and peroxide; spread it in the spot and wait for it to dry. Vacuum the residue when it's completely dry. 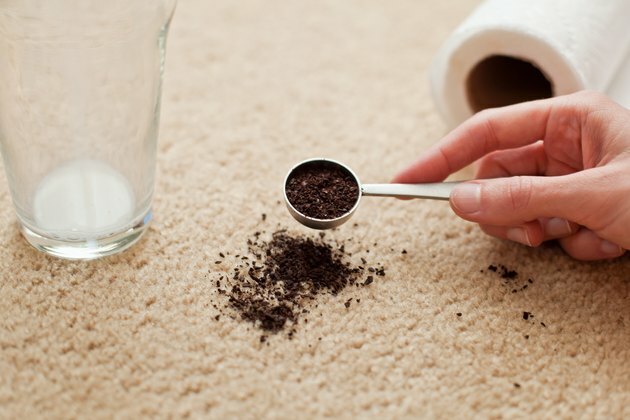 Coffee grounds also deodorize the smell from spoiled milk; spread them liberally on the spill, and leave them for a few hours and vacuum them up. Vinegar is another alternative; spray it on the spill and blot it up. If the carpet has been dyed with natural dyes that you aren't sure are colorfast, it's best to dilute vinegar with an equal part of water to prevent fading. You can also deodorize spoiled milk with baking powder. Sprinkle it liberally on the spill; leave it overnight and vacuum in the morning.